I was going to write about Martian canals. There are no waterways on Mars, but for a while lots of intelligent people thought that there were. It was the Italian astronomer, Giovanni Schiaparelli, who kickstarted the idea accidentally. In 1877 he observed long, straight lines on the surface of Mars and called them canali. That is, channels. From 1895 onwards, Percival Lowell wrote about the surface markings on Mars. He admired Schiaparelli and agreed about the canali, which he mistranslated as canals. 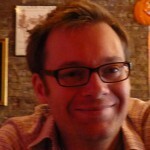 And if there were canals flowing on Mars, he argued, surely there must be an intelligent Martian race that built them. It’s not that the astronomical community was entirely won over by the idea. As early as 1909, Martian canals had fallen out of favour. Even so, the concept crept into the public consciousness in other ways. While H.G. 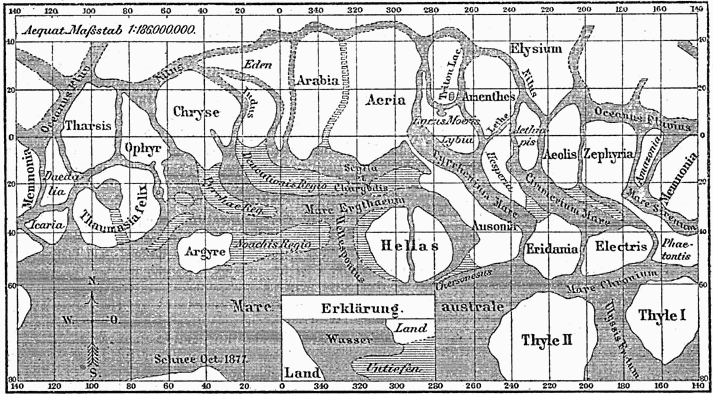 Wells’ War of the Worlds (1897) featured a barren Mars, Edgar Rice Burroughs took those canals and ran with them. Martian irrigation waterways appeared in A Princess of Mars (1912), which, along with its sequels, became a smash hit. His depiction of Mars defined the planet to a generation of schoolchildren. Some of those kids grew up to become writers, with Burroughs’ Mars still lodged in their minds. 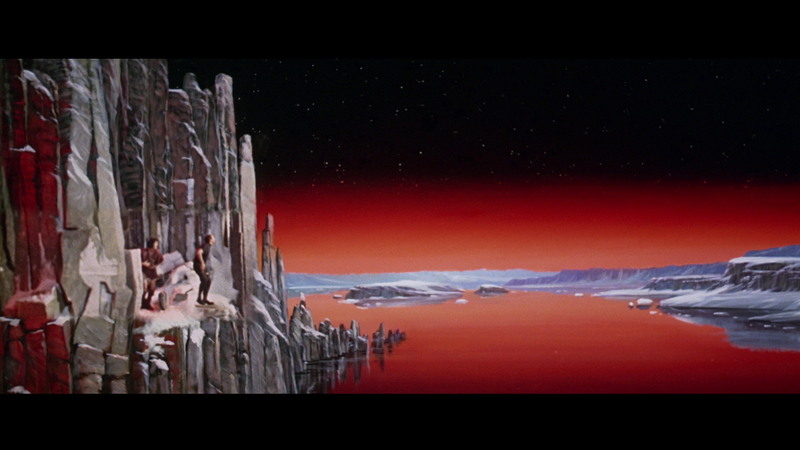 Robert Heinlein’s Red Planet (1949) featured teen students skating home on the frozen Martian canals. 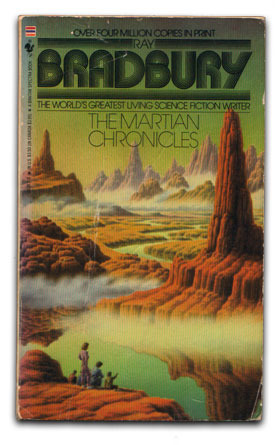 The canals appeared in Ray Bradbury’s sublime Martian Chronicles (1950), too. My guess is that these writers understood that the canals weren’t literal, but that the idea was too appealing for them to ignore. In 1965, Mariner 4 came along and spoiled the party. Photos from the NASA spacecraft showed impact craters on Mars but no hint of channels, let alone canals. Thankfully, one final work of fiction snuck in, just months before Mariner 4 was launched. So. I was going to write about Martian canals, but instead I’ve decided to write about my favourite science fiction film of 1964. The plot of Robinson Crusoe on Mars is pretty basic. An astronaut named Kit Draper is stranded alone on Mars and must devise methods of survival. Later, he finds not one, but two ‘Man Fridays’ (‘Men Friday’?). The first is Mona, a monkey in an orange spacesuit; the second is a mute, humanoid Martian slave. When the slave’s masters come searching for him, they flee and are finally rescued by Draper’s astronaut pals. It’s easy to write it off at first. Draper’s spaceship appears to be operated via an old-fashioned gas meter. His astronaut partner is Adam ‘Batman’ West. Draper’s first instinct after crash-landing is to pull off his helmet and take a deep breath. Rather than a raygun, he’s packing a revolver. And that spacesuit the monkey’s wearing? It has a hole cut out for its tail. But it’s a wonderful film, all the same. Mars is convincingly represented by Zabriskie Point in Death Valley, California (I’ve been there – it really is alien, and the sand burned my feet). The early scenes when Draper explores the planet alone are genuinely eerie and his madness is believable. Though it’s far less scientifically rigorous, Draper’s ingenuity in developing sources of fire and water is as compelling as Mark Watney in Andy Weir’s The Martian – the film adaptation of which will be released in October, allowing viewers to make a direct comparison. And, in the last fifteen minutes, the Martian canals provide some of the most memorable moments in the film. These canals are actually underground gulleys, left unstable by earthquakes. They’re icy and treacherous, with occasional fiery eruptions. The scenes of Draper scaling the ice platforms shift the film from conceptually creepy to outright nightmarish. I know, I know. I may be rambling, but there’s a point here. Good ideas in SF propagate like viruses. Edgar Rice Burroughs borrowed an idea based on a misconception, then other writers borrowed from Burroughs again and again, exploring the same idea. Even today, writers refer to the Martian canals, tipping the hat. I’ve included them in some of my own stories, as a term for the traffic lanes of Martian hover-carriages. There are plenty of other examples of this sort of appropriation. In 1966, Ursula K. Le Guin coined the word ansible to describe a device capable of transmitting messages instantly over large distances. The word and the device were later borrowed by Orson Scott Card, Kim Stanley Robinson, Dan Simmons and others. It’s what science fiction does. Ideas are lifted from earlier works, then turned over and examined afresh. This borrowing and appropriation is far from theft – and it’s one of the things I most love about the genre. I’m grateful that SF writers are generally so gracious about having their good ideas reworked. 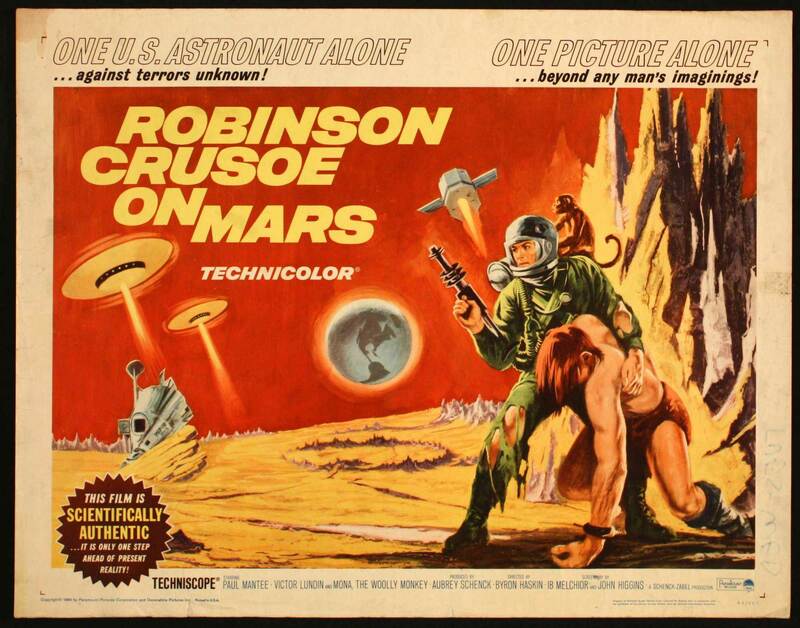 But most of all, after yet another late-night rewatch, I’m grateful for Robinson Crusoe on Mars.